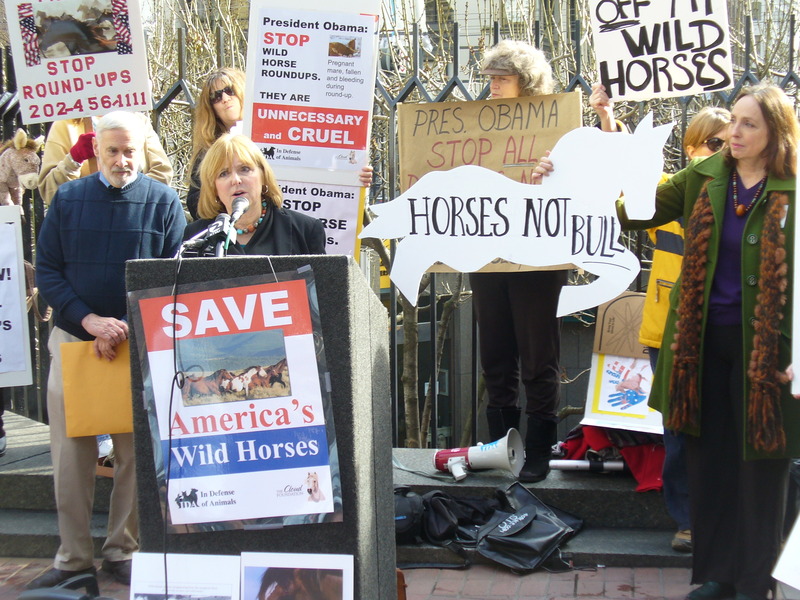 WASHINGTON (January 24, 2013)–Wild Horse Freedom Federation (WHFF) released evidence exposing the Bureau of Land Management’s (BLM) wild horse long-term holding contractor selling wild horses to an alleged “kill buyer”. The BLM appears to be trafficking wild horses to slaughter through holding facilites. Debbie Coffey, volunteer director of Wild Horse Affairs at WHFF, uncovered evidence of the contractor selling at least 34 federally protected wild horses. In short and long-term holding, indigenous wild horses retain their wild status and protections but it appears some are being sold to slaughter. WHFF joins with Protect Mustangs to call for a freeze on roundups, access to document all holding facilities as needed as well as an immediate Congressional investigation into the BLM and their contractors allegedly selling America’s iconic wild horses into the slaughter pipeline. Coffey, with the assistance of Animal’s Angels, researched and released Wednesday an in-depth article on the activities of a BLM contractor selling 34 BLM wild horses to a kill buyer, while under contract with the BLM and being paid with U.S. taxpayer dollars, to care for iconic wild mustangs on its pastures. Evidence was obtained through South Dakota Brand Board Inspection records and Freedom of Information Act (FOIA) requests. Information from government and public records show that Jim Reeves and Lyle Anderson own Spur Livestock. They have a contract with the BLM for a wild horse long-term holding pasture on private land within the Cheyenne River Sioux Reservation in South Dakota, as well as on Indian Trust Lands administered by the Bureau of Indian Affairs. This U.S. taxpayer funded facility is the Whitehorse Wild Horse Long Term Holding Facility. 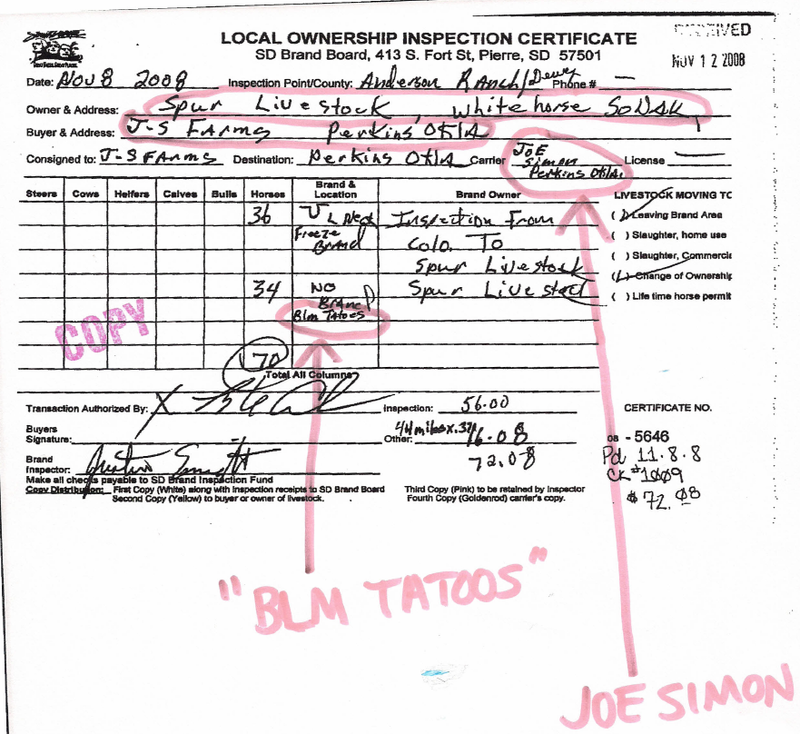 WHFF received records from the South Dakota Brand Board that reveal on 11/8/2008, while under contract with the BLM, “owner” Spur Livestock sold 34 horses with “BLM tattoos” to JS Farms–owned by alleged kill buyer Joe Simon. When asked about all the wild horses who disappear from their short-term holding facilities after the roundups, BLM officials inform the public and the media that they will be well taken care of on “grassland pastures”. Wild Horse Freedom Federation (WHFF) is a registered, Texas non-profit corporation with Federal 501c3 status and registered as a legal non-profit in all 50 states of the Union. WHFF puts people between America’s wild equids and extinction through targeted litigation against governmental agencies whose documented agendas include the eradication of wild horse and burros from public, federal and state lands. WHFF is funded exclusively through the generosity of the American public. California-based Protect Mustangs has been working hard to stop the Twin Peaks roundup once we brought you the news of the Rush Fire last summer. We are grateful several wonderful advocates such as Craig Downer, Grandma Gregg, Jesica Johnston, Barbara Clarke, Monika Courtney, R.T Fitch, Debbie Coffey and many others have joined the fight to protect the Twin Peaks wild horses on the range. Keep contacting your elected officials across the country to educate them about how the Twin Peaks wild horses can heal the land after the fire. Let them know these federally protected wild horses deserve to remain on their range. Tell them removals are cruel and costly–warehousing them for decades is not sustainable. Request the Twin Peaks roundup be cancelled. Thank you for helping California’s wild horses and burros. Please make a donation to help Protect Mustangs continue our work for the wild horses. Thank you. Below is the email we received today from Ken Collum at the BLM. There will be no imminent roundup operation in the Twin Peaks Herd Management Area (HMA). The situation will be re-evaluated this January. HMA population information obtained from September’s aerial inventory will be available soon. 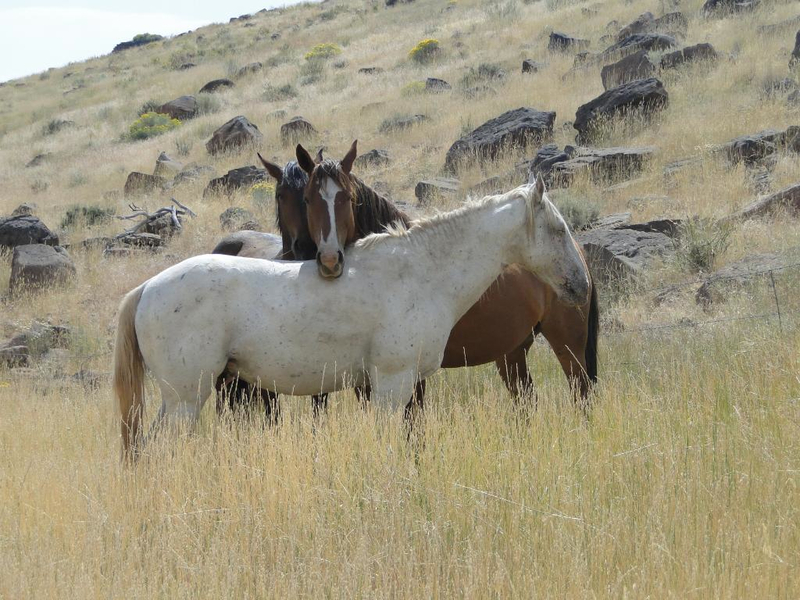 RENO (May 28, 2012)—Protect Mustangs has discovered that the Bureau of Land Management (BLM) scheduled an important public hearing for 10 a.m. the morning after Memorial Day weekend without adequately notifying the public. The hearing is scheduled for 10-11 a.m., at the BLM Carson City District Office, 5665 Morgan Mill Road, in Carson City, Nevada. The wild horse preservation group is requesting the BLM reschedule the public hearing—regarding the use of helicopters and other motorized vehicles for roundups and management—in order to give the public at least 30 days notice. Advocates, as well as members of the public nationwide, would like to attend the hearing but they need 30 days notice to make arrangements. Before helicopters or motorized vehicles can be used, a public hearing is required in order to comply with Section 404 of the Federal Land Policy and Management Act. The BLM proposes to use a helicopter, fixed wing aircraft and other motorized vehicles to estimate population numbers and obtain seasonal distribution information for wild horse and burro herds throughout Nevada. Also proposed is using a helicopter to assist in gathering excess wild horses and burros on gathers and complexes throughout the state during the coming year. The actual number of areas where gathers will be conducted or inventoried will depend on a number of factors including funding. Controversial helicopter roundups harass and stress wild horses and burros—stampeding them for miles, often resulting in lameness and sometimes in death. 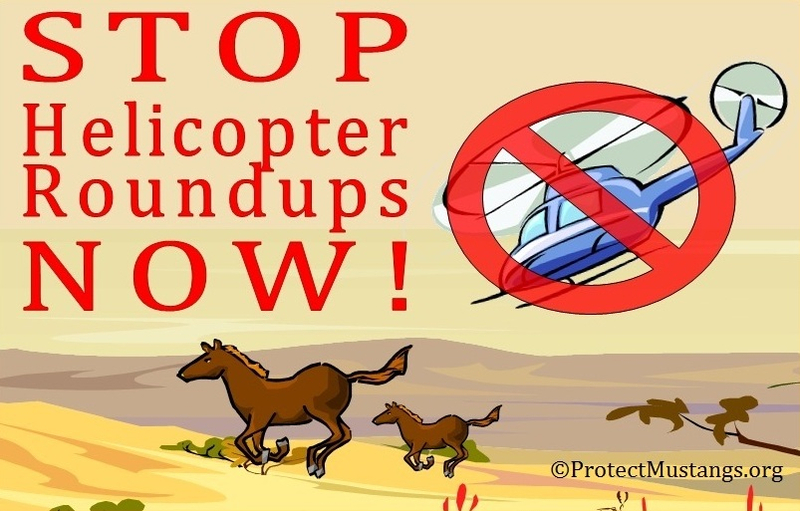 Besides being concerned about animal cruelty at helicopter roundups, Protect Mustangs believes that helicopters flying in the desert for days or weeks emit pollution that harms the environment and contributes to global warming. The group believes motorized vehicles damage the ecosystem—hurting many forms of wildlife, such as sage grouse, and other endangered species on the range as well.